Josh taped an episode of Food Paradise on The Travel Channel that showcased their top picks for Mexican food. He wasn’t kidding when he said they featured some of the most delectable dishes. This is the first of two that I just had to make. A restaurant in Chicago “Carbon Live Fire Mexican” shared their Stelote burrito made primarily with steak and elotes aka Mexican Street Corn. I have watched that episode more times than I can count and have finally gotten around to making this mouthwatering burrito. Only I pan fried it so technically it’s a chimichanga. Either way you will love it! I grilled the corn along with the steak so they would have those fire roasted flavors. I removed the corn from the cob and added the dressing from my own “Mexican Street Corn” recipe. The steak seemed plain so I added some chimichurri sauce to the mix and wow did that enhance the flavors. Some folks serve rice and beans . . . me . . I just need my guac and salsa to complete this meal! There’s nothing better than freshly made warm flatbreads. For years I’ve been making batches of flatbreads that I could store in the fridge. 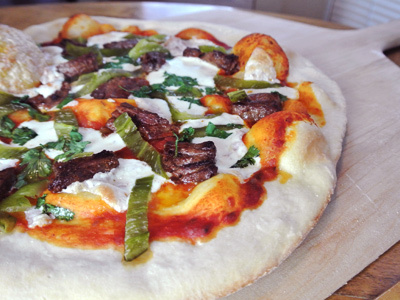 My boys loved them because they could make a quick pizza or stuff them with taco meat and cheese. They can be cut into triangles and toasted for fresh pita chips that can be dipped or topped with all sorts of things. What I had in mind this time was a gyro using skirt steak. I marinated bite size pieces of steak and stir fried it in my mini wok. Chicken or pork can be substituted for the steak as well. Add some sliced onion, chopped tomato and a dollop of tzatziki sauce and you’ve got a fresh meal that tastes every bit as good as if you had gone out to a restaurant. I’m taking a break from the winter soups and pastas. Most of the time it’s just Joe and I at the kitchen table and we enjoy a good sandwich as much as anything. I picked up a skirt steak and some veggies to make my version of the Philly Cheese Steak sandwich. Stir frying the steak and veggies makes such a quick and easy meal. I have a mini wok that I love to use for just the two of us. It’s seasoned just like a cast iron skillet and everything tastes so good in it. Philly cheese steaks are traditionally served with onions, mushrooms and green bell peppers but I personally love the taste of the sweet ornamental peppers. I can say without a doubt that these peppers add a great new taste to an already famous sandwich. Any New Mexican will tell you that we eat green chile with everything. And those of us who no longer live in our Native home will go to great lengths to find it. It’s one of those comforts that’s hard to live without. I have always loved steak and green chile together. 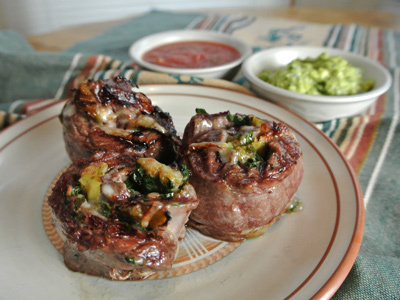 I’ve wrapped tenderloin steaks with green chile strips just like you would bacon and the combination is hard to beat. Here I took a skirt steak and brushed it liberally with a chimichurri, then layered some roasted Hatch green chile and Manchego cheese slices, rolled it up and sliced into pinwheels. This pinwheel just oozes flavor. On the side I made a guacamole with roasted corn and my own green chile salsa to compliment the meal.